General purpose caulk. Paintable. Water clean-up. Rubber-like acrylic sealant. Oderless, non-flammable, mildew resistant, water clean-up. Paintable. Won't stain or bleed. Meets ASTM Spec C 834-76. Bonds like glue, seals like caulk. Durable, watertight seal. Excellent adhesion and flexibility. Paintable. Water clean-up. This premium adhesive caulk includes Microban® antimicrobial product protection to fight the growth of stain- and odor-causing bacteria, mold, and mildew. Its special formulation of siliconized latex maximizes adhesion and flexibility for a watertight seal. Paintable. Clean up with water. Crack proof guarantee. Premium quality water based caulk for use in high humidity areas such as bathroom and kitchen. Paintable, water resistant. Mildew proof, guaranteed. Soap and water cleanup is easier and more effective with Loctite Polyseamseal. Unlike silicones, there is no mess or odor to worry about when using this product. This Sealant Is: Water-Resistant, Mildew-Proof, Strong Enough to Reset Tile. For High Humidity Areas Such As Kitchens And Baths. formulated With Bioguard, An Antimicrobial Agent, To Help Prevent Stains And Odor Caused By Mold And Mildew Growth On The Caulk Surface. Silicone Added For A Water Tight Seal. 100 % silicone. Will not crack, shrink or peel. Can be applied at temperatures below freezing. Rapid, room-temperature curing. Solvent clean-up. Not paintable. Advanced acrylic formula with silicone applies easily and adheres to all surfaces including wood, masonry and siding. Expands and contracts with temperature. Water clean-up before cure. Paintable, won't stain or bleed. Superior adhesion. Water tight and weatherproof. Will not shrink or yellow. Withstands most extreme indoor/outdoor conditions. Adheres to more than 50 household surfaces. 25 year durability. Adheres to plaster, wood, drywall and masonry. Paintable. Meets ASTM specification C-834 for extrudability, weathering, extension recovery, and slump. Secure the appeal and longevity of your customers’ kitchens and bathrooms with this mildew-resistant sealant. It’s made from advanced 100% silicone rubber that offers 50-year durability and excellent flexibility! 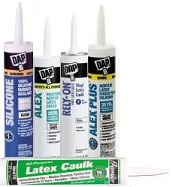 Premium quality water-based adhesive caulk, sticks like glue! Stays flexible, resists mildew. Guaranteed lifetime durability. Paintable. 10.5 Oz cartridge. This unique high-solids, low-solvent formula provides a strong waterproof bond to most bath surround products. Steam and heat resistant. Recommended for most plastic tub and shower enclosures over structurally sound drywall, hard board and ceramic tile. Voc compliant. Piston rod with double friction plate. Long trigger leverage. Thumb pressure release.